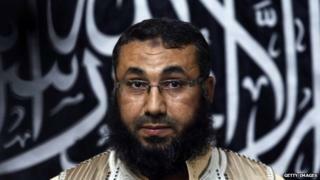 Libyan Islamist group Ansar al-Sharia has confirmed that its leader Mohammad al-Zahawi has died. In a statement, the group said "we mourn the death of the emir", without giving further details. His death is thought to have resulted from wounds sustained in a battle with Libyan government troops in the eastern city of Benghazi last October. The group is blamed for the 2012 attack on the US consulate in Benghazi, in which the US ambassador was killed. Three other Americans also died. Ansar al-Sharia, which calls for the implementation of Sharia law across Libya, denies being behind the attack. The group, whose name means "Partisans of Islamic law" in Arabic, emerged following the February 2011 anti-Gaddafi uprising. It is made up of former rebels from several militias based in eastern Libya, notably the Abu Obayda bin al-Jarah Brigade, the Malik Brigade and the 17 February Brigade. It has been designated a terrorist organisation by both the UN and US.